65 sqm apartment with veranda overlooking the sea. Independent apartment, located in the middle of the two piers of the island, spread over two elevations, the living area and the exclusive veranda overlooking the sea where you can enjoy a wonderful panoramic view, The house is finely furnished and equipped with all the 'necessary for pleasant stays, the spaces are spacious and bright, the bedroom is located in the inner part of the house, protected from summer noises, for a regenerating rest. In addition to the veranda with beautiful views and proximity from the sea the fact that the makes it unique is that it is located in a strategic position because you can reach within a few meters the main square, church, ATM, grocery, bakery, restaurants, bars, pizzeria, pharmacy and ship boarding, hydrofoils, floating jetty, beaches a few meters ,. We stayed here five nights to celebrate the local festival of San Giuseppe, St. Joseph, which is also the day when Italians celebrate Father's Day. San Giuseppe is the patron saint of the island, so there are several days of special events, including marching bands, fireworks, special bread, mass in the piazza, a slow procession of the saints (St. Joseph and St. Francis Paolo) through the streets of town. The apartment was very comfortable, well-equipped, and conveniently located. Weather is variable at this time of the year, but it was great for hiking around the island. There were few tourists, mostly family members returning for the March 19th festival. We hope to return to Marettimo soon and stay at the Dimora Tipica. 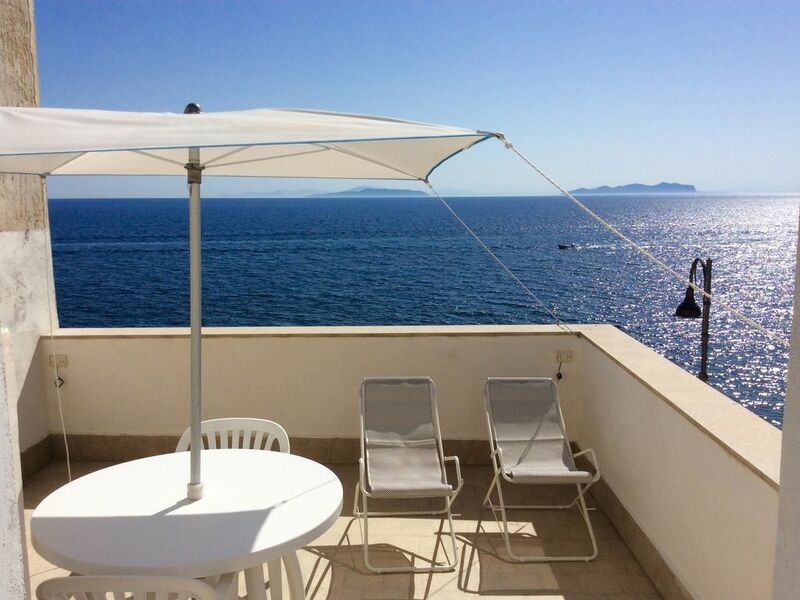 Appartamento accogliete, ben curato, pulito, attrezzatissimo, con una favolosa terraza sul mare. Estrema disponibilita’ e cordialità dei proprietari. Speriamo di poterci tornare presto! Si richiede anticipo pari al 50 per cento come conferma di prenotazione ..Si prega di rispettare l'orario del check-in ore 14,30e check -out ore 9,30 . Ricordatevi di spegnere luci e condizionatore d'aria quando non servono . Di chiudere porte ,finestre ,balconi e gettare la spazzatura al check out .Curare la nostra casa ,come se fosse la vostra ...grazie per la collaborazione.